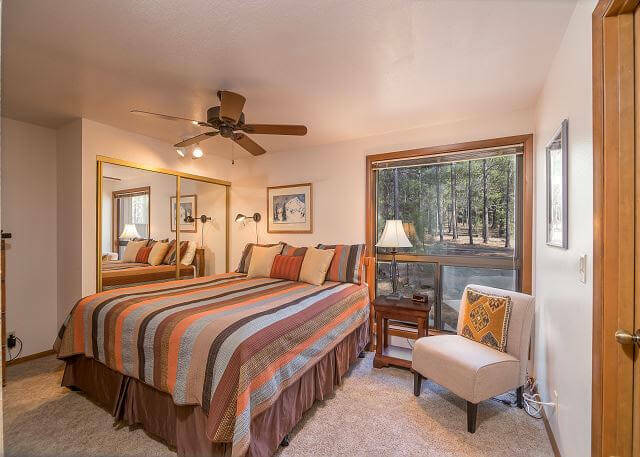 Established in 1987, Sunset Lodging in Sunriver, Oregon has grown into a thriving vacation rental company and is simply one of the most incredible places you can stay when vacationing in Oregon. 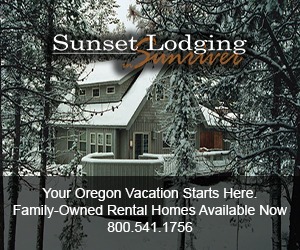 When you book a Sunriver Vacation Rental at Sunset Lodging, you’re guaranteed to have the best vacation of your life. 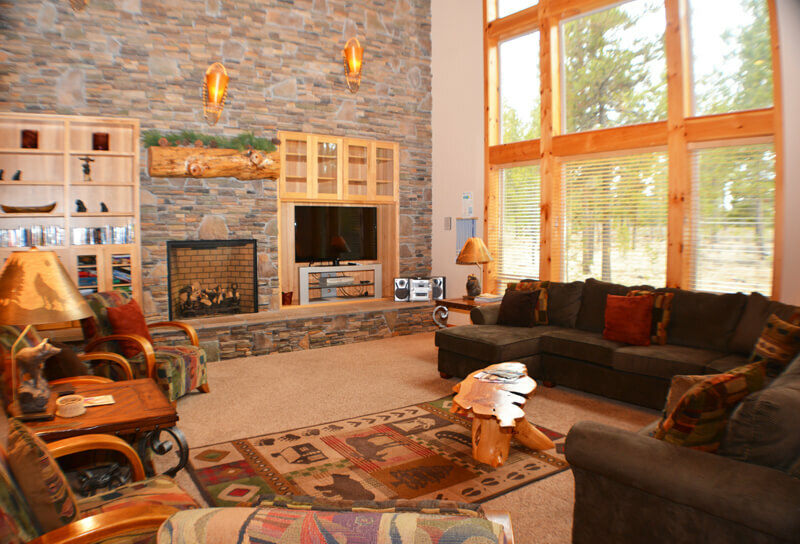 Sunset Lodging takes pride in having the best value in Sunriver and are known for their impeccable service. Snowboarding or skiing at Mt. 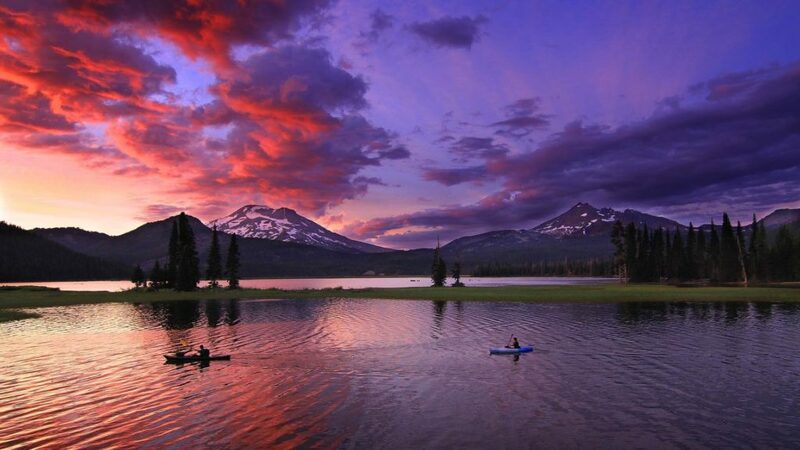 Bachelor, hiking, kayaking on the Deschutes River, and white water rafting is just a few of the activities enjoyed in one of central Oregon’s most beloved areas. 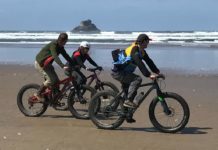 Sunset Lodging is proud to offer family-style vacation rentals, fully equipped for groups of any size. And with the largest selection of pet-friendly homes in Sunriver, your furry family members are welcome to enjoy the vacation, too! 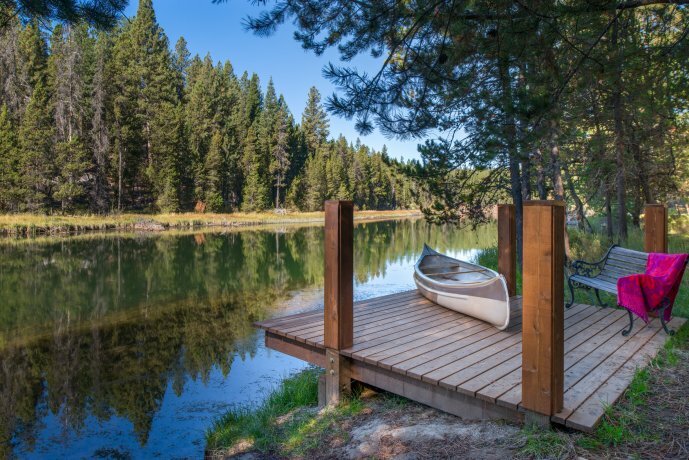 From the lakes, rivers, mountains and hot springs set in the foothills of the Cascade Mountains, Sunriver boasts 300 days of sunshine and offers the perfect climate for outdoor lovers. 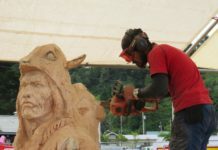 To the wide array of festivals, live music, culinary treasures, and cultural events, Sunset Lodging has the keys to your lifelong family vacation memories. 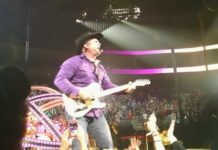 The bedroom on the main level offers a king-size bed and the 2nd bedroom upstairs has a queen bed. The loft has 2 twin beds…perfect for families traveling with children. There ialso a queen hide-a-bed in the living room. Hit the link here to reserve this home now. 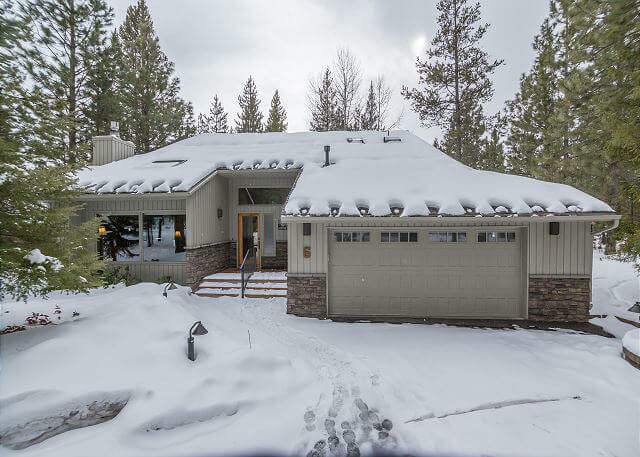 This premier Sunriver vacation rental includes five bedrooms and three bathrooms. There are two bedrooms downstairs. One is a master with a king bed plus TV/DVD. The second is a queen room with a TV/DVD. There is also another full bath downstairs. Both of the bathrooms have showers (not tubs). There are 3 bedrooms upstairs. One has a king bed, one has a queen and one has a twin double bunk bed plus a twin bed. All of these rooms have TVs/’DVDs. 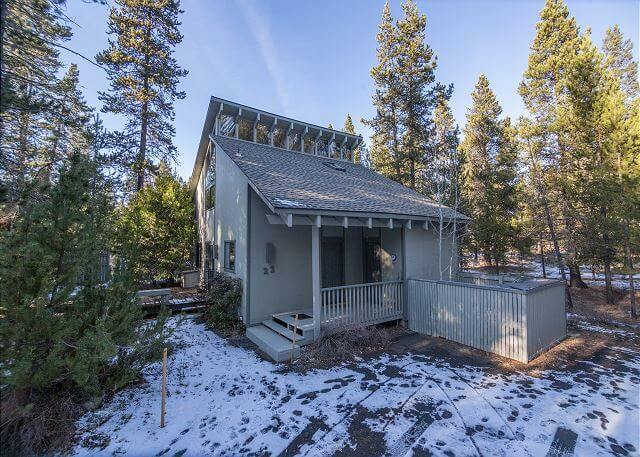 Located on the Deschutes River in Sunriver is a spacious, reverse living, 3 bedroom vacation perfect home! Floor to ceiling windows welcome you as you step inside. 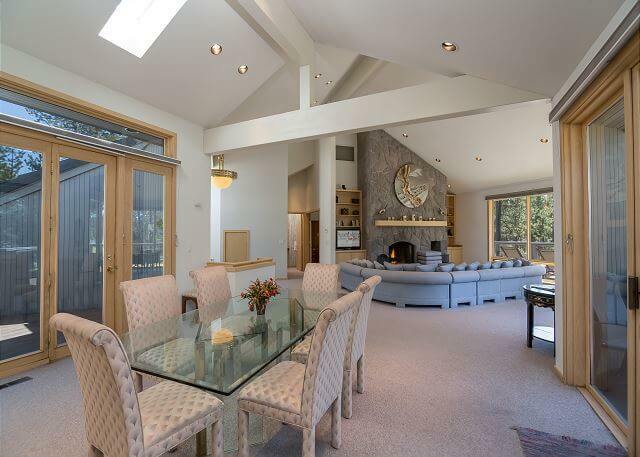 The large living room boasts a gas fireplace and wrap around sofa, perfect for family gatherings. The fully stocked kitchen looks out to the river and opens up to the dining area. The master bedroom is on the main level with private access to the upper deck and looks out to the river. 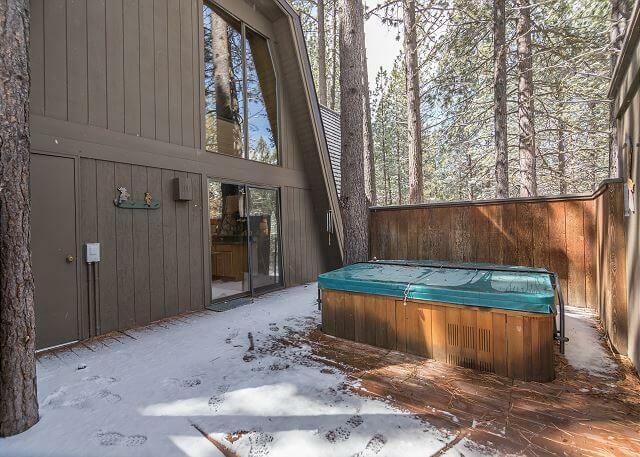 There is a jacuzzi tub in the master bath. The office on the main level has a double futon for an extra sleeping area and a built in desk to set your laptop on while you get online using the free wireless, high speed internet access. 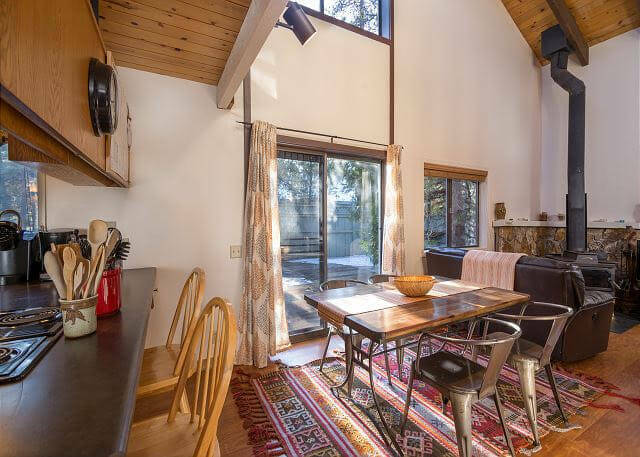 The lower level of Siskin #9 includes a den area that also looks out to the river with a wood fireplace and a 28 inch flat screen TV. The two bedrooms downstairs is a queen and a twin….2 twins to be exact. Perfect for children and multi families! 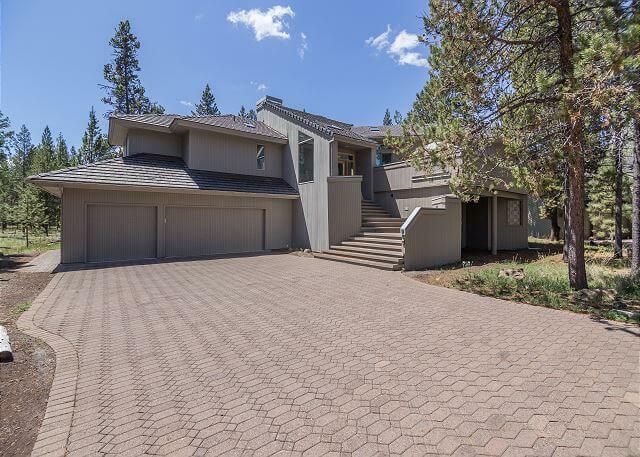 The 2 decks of this luxurious vacation home presents the magnificent Deschutes River. 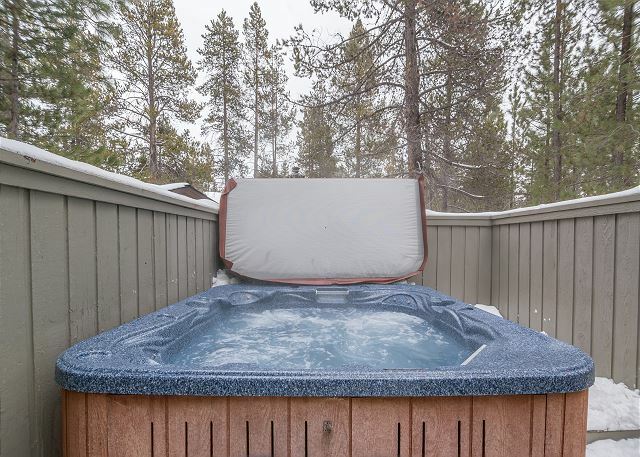 Relax in your private hot tub or use the gas BBQ as you take in the scenery of Sunriver! 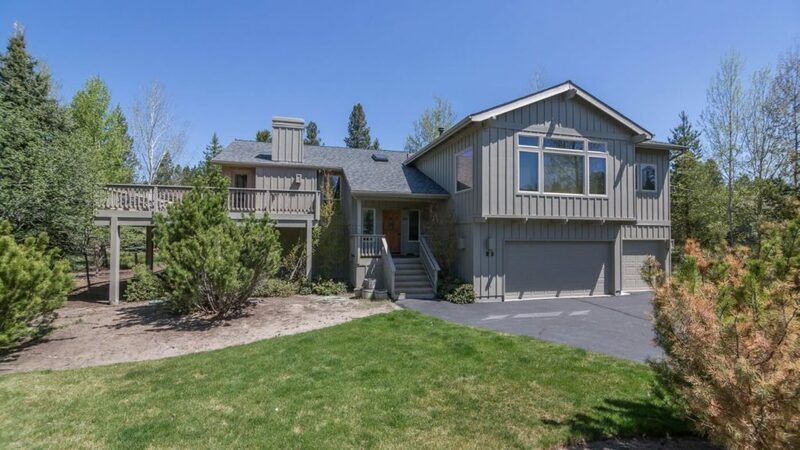 This home provides 8 Unlimited SHARC passes, free tennis, free shuttle to Mt.Bachelor and free access to the Sunriver Marina! Cozy three bedroom, two bath ranch home with open kitchen layout. 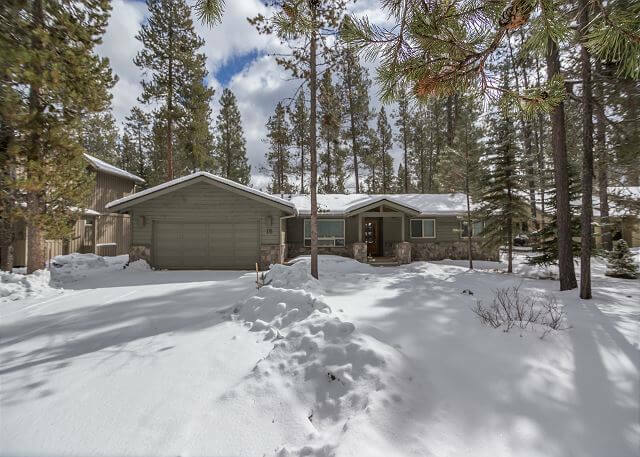 Located in the quiet north end of Sunriver near the Deschutes River and the Cardinal Landing bridge to the national forest. 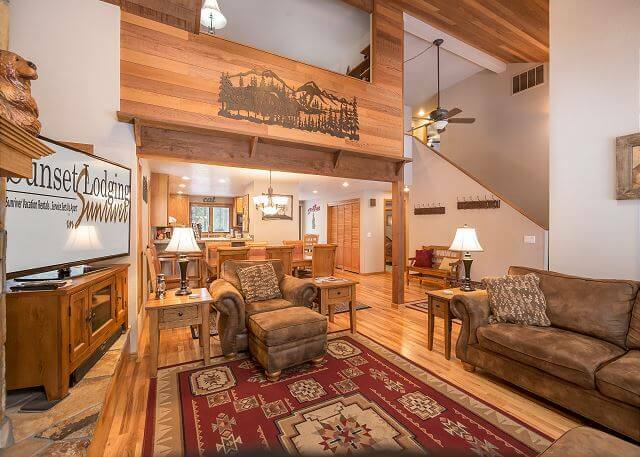 Great location for floating the river and enjoying the surrounding forest all year round. 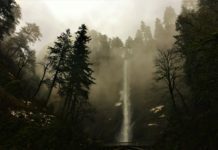 Fantastic hiking and mountain biking in the summer as well as snowshoeing and cross-country skiing once the snow falls. This home features new furniture throughout, 2 queen beds, 2 sets of bunk beds, three flat screen TV’s, surround sound in the living room, Wi-Fi internet, fireplace, gas range, gas BBQ, hot tub, front patio and large back deck. 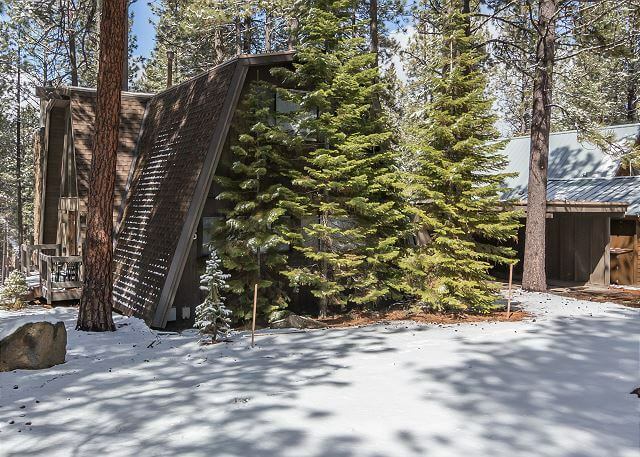 The property backs up to a large common space with no neighbors behind giving a secluded feel. 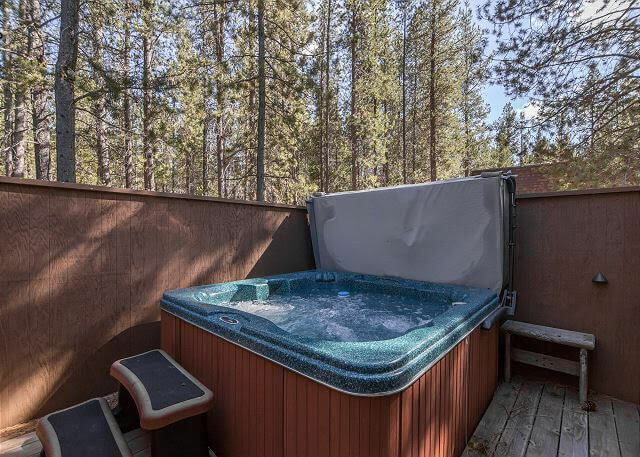 2 Queen beds, 2 bunk beds, hot tub, 3 TVs, DVD player, stereo, D/W, W/D, microwave, gas BBQ, fireplace, single garage, deck, close to mall & trails, 1650 sq ft, sleeps 8, 8 Unlimited SHARC passes, close to river. 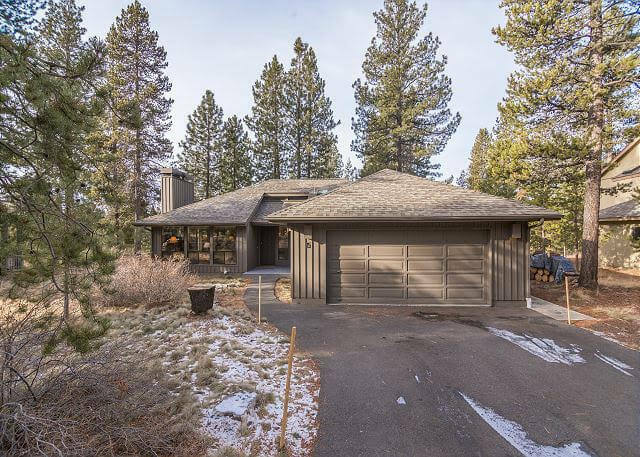 This modern, light and bright single level home is located on Sunriver’s North end close to the North Store & Benham Falls. 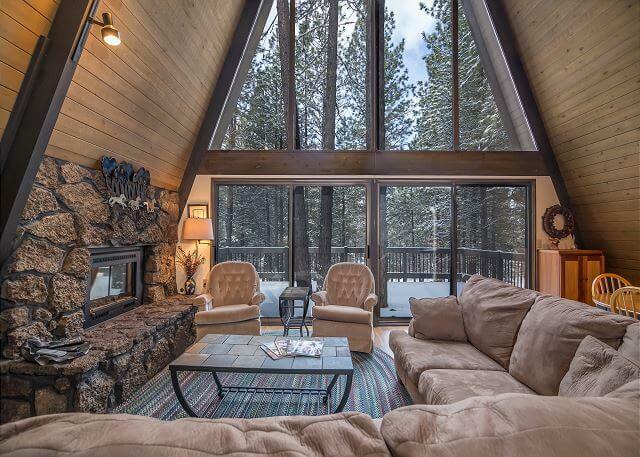 The open floor plan is inviting with a fireplace in the living room. 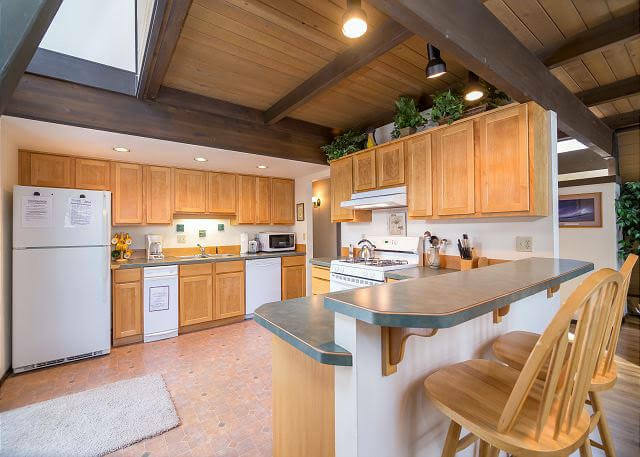 The large dining area leads to the fully stocked kitchen. The 3 bedrooms are equipped with a king in the master a queen and a set of twins. 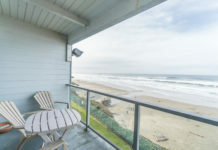 Great for a family with children and a fenced in deck so your pets can enjoy the vacation as well! Enjoy 8 Unlimited SHARC passes with Hart Mountain #5. Float the Lazy River, zoom down the water slides or just lounge in the Central Oregon sun. The SHARC is a big hit with families with kids! 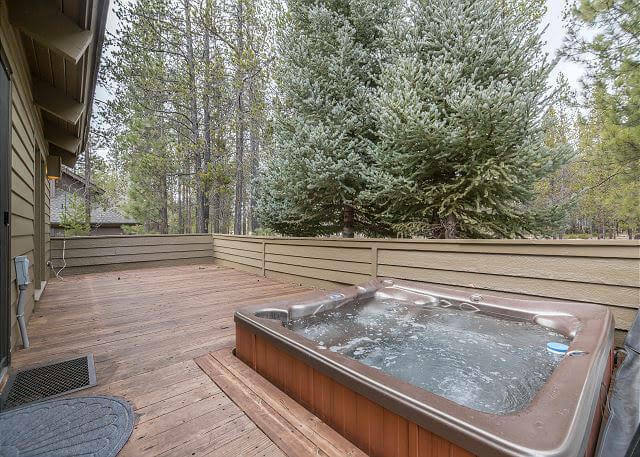 Relax in your private hot tub or grab the bikes and ride Sunriver’s 30 miles of paved bike paths. 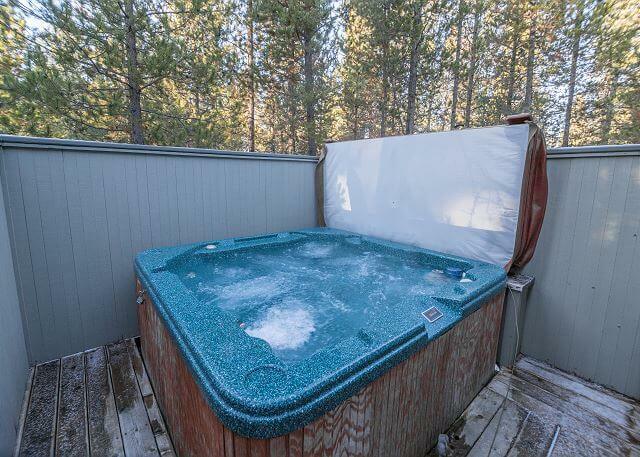 1 King, 1 Queen, 2 Twins, 1 double HAB, all new mattresses 5/06, 2TVs/2VCRs, DVD player, CD stereo, D/W, W/D, microwave, HOT TUB, gas BBQ, fireplace, garage, bikes, pet-friendly, 1 level. NO PETS OVER 100 LBS. 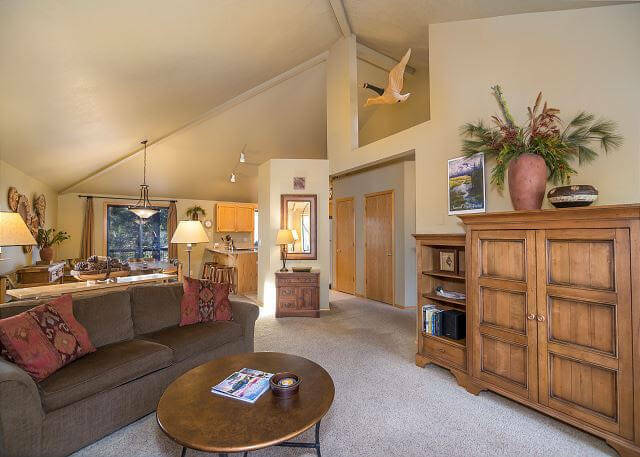 East Butte #22 is a 2 bedroom/2 bath private home off Beaver Drive with easy access to SHARC Aquatic Facility and the home comes with 6 unlimited SHARC passes. 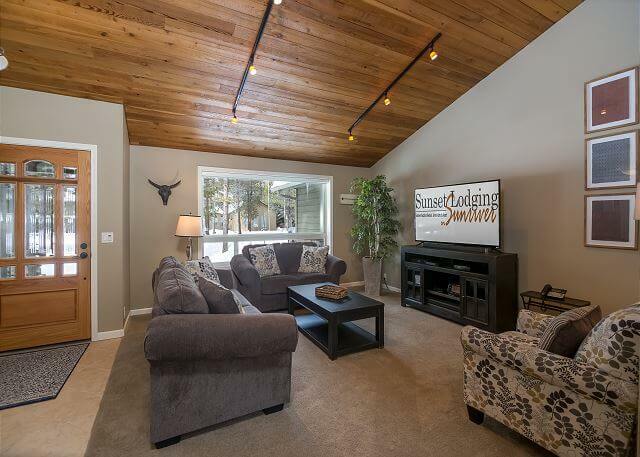 The living room welcomes you with a wood stove, comfy sofas and New 55 inch TV to gather with family and friends. 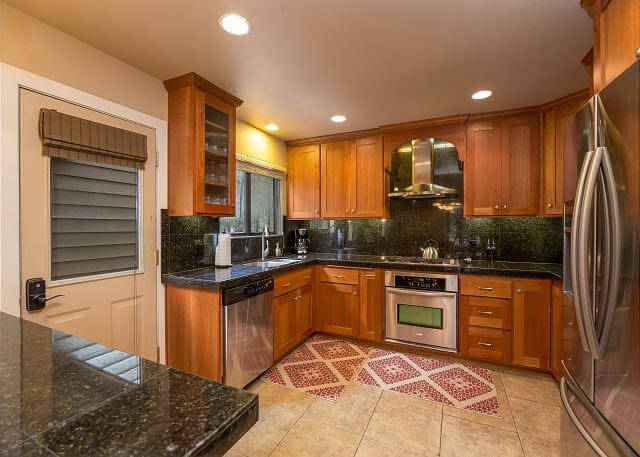 The dining area leads to the fully stocked kitchen in this 2 level vacation home. 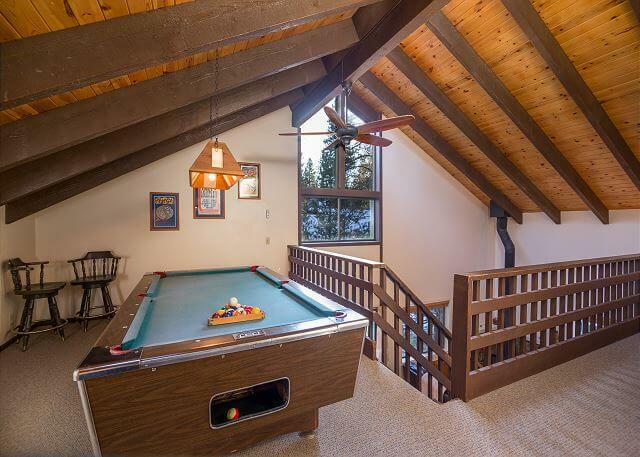 The loft area has a pool table, queen futon and a queen bed. 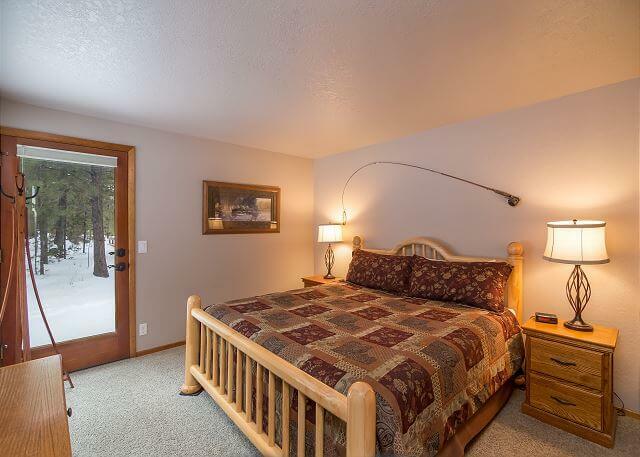 The 2 bedrooms on the main level provide a queen bed and the master bedroom a private bath. 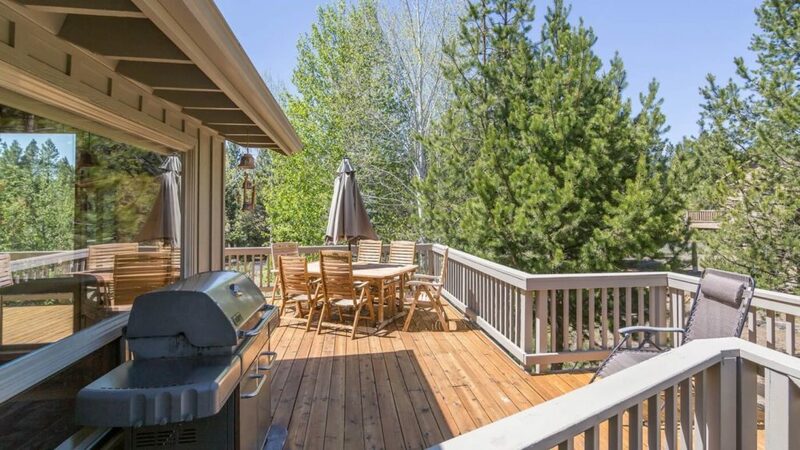 The large deck has a gas BBQ and hot tub. 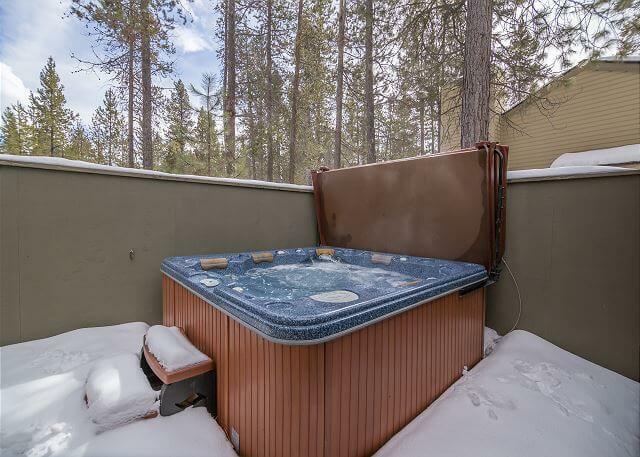 Relax in the hot tub while dinner is grilling under Sunriver’s year round sunshine. Grab the bikes and get on the paved bike paths to Fort Rock Park or the Village Mall. 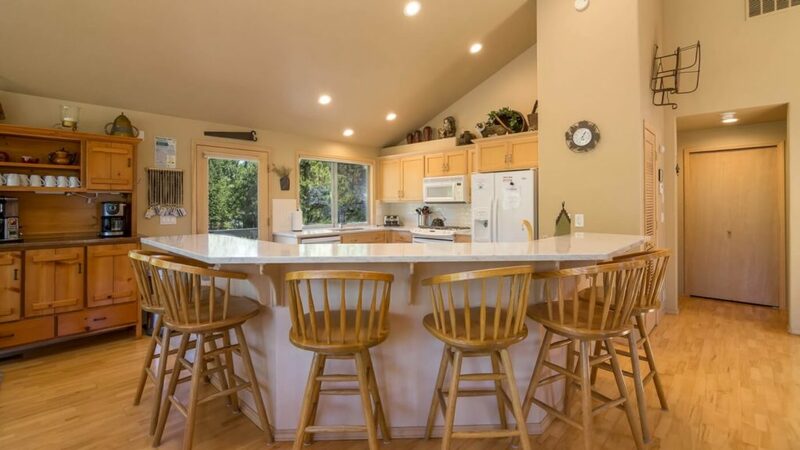 3 Queens, 1 Queen Futon, HOT TUB, 3TVs/2VCRs/2DVD players, CD stereo, D/W, W/D, microwave, gas BBQ, wood stove, 5 bikes, 6 SHARC passes, 2 levels, pool table in loft, large deck, near Ft. Rock Park, 1300 SQ FT.
Quelah Lane #23 is one of Sunriver’s most luxurious vacation homes. Truly a favorite among ‘Sunriver Regulars’, this 6 bedroom, 5 and 2 half bath dream home has 4 master suites and a game room with a wet bar & pool table. 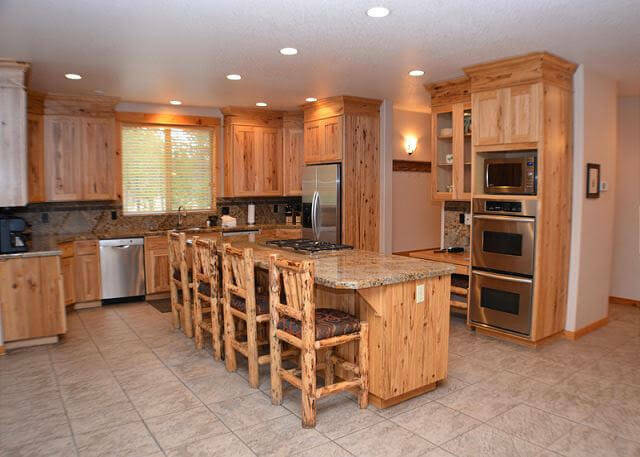 This kitchen is a chef”s dream, with 2 ovens, 2 refrigerators, seating for 16 guests and tons of kitchen extras. 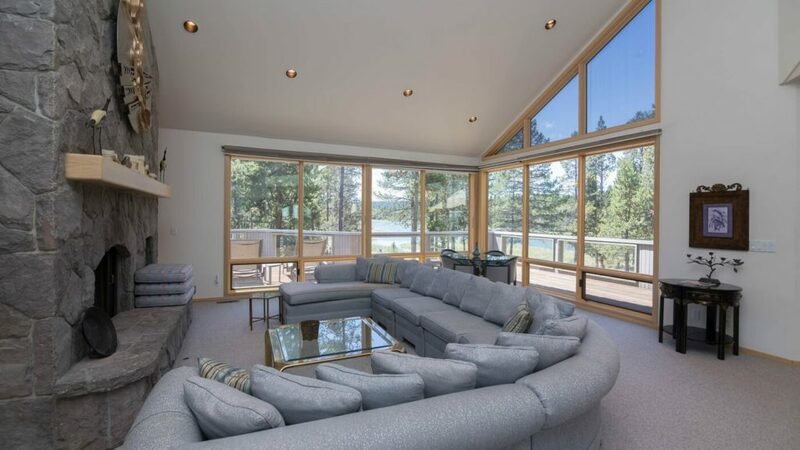 The home also features 8 TVs, 2 VCRs, 4 DVD players, surround sound, 2 CD stereos and a private hot tub to sit and relax after a fun day of Central Oregon recreation! 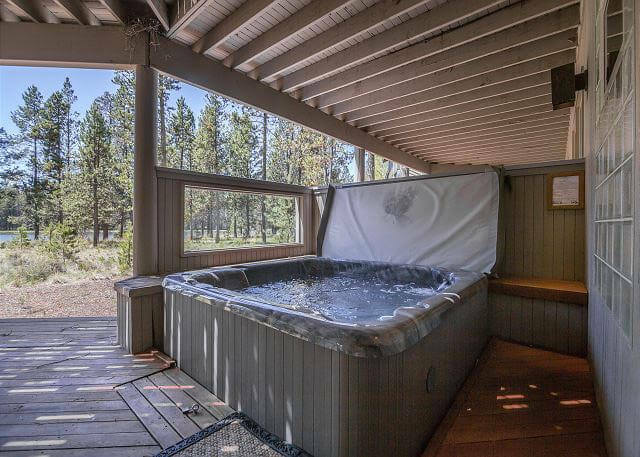 Nestled in the northwest end of the Sunriver resort community near the Benham and Dillon Falls trail, the Sunriver Bittern Lodge is a lavish lodge-style home featuring 8 bedrooms, 8 bathrooms and a game room. Bittern Lane #5 is a luxury rental home perfect for those large family gatherings like family reunions, weddings, corporate business retreats and church retreats. 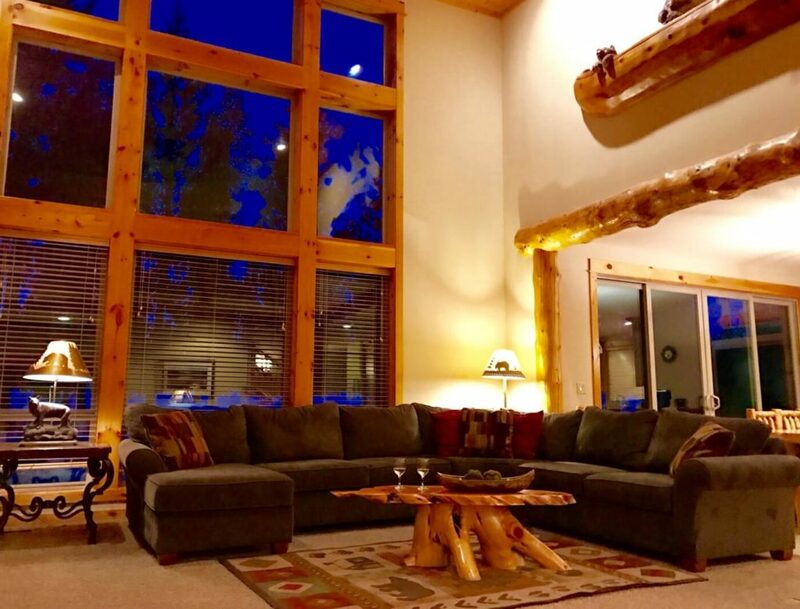 The Bittern Lodge is a pet friendly Sunriver vacation home, too! With 5,300 square feet of living space contained within a mere 2 levels, this superb home will accommodate your large group effortlessly. The eight bedrooms and eight bathrooms give the needed space and privacy for a group of couples or singles looking to enjoy a weekend escape among friends. Six master bedrooms feature all large beds—five of bedrooms contain king-sized beds, and a queen in the other bedroom. 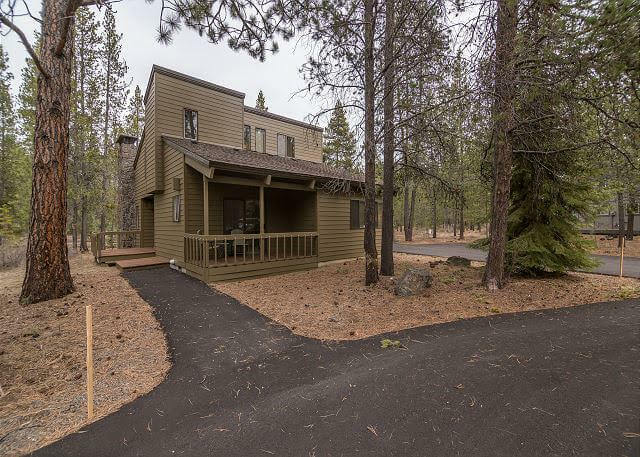 With over 30 miles of paved biking trails throughout Sunriver which are easily accessed from every vacation rental, 2 dozen golf courses within 20 miles of Sunriver, and SHARC featuring indoor and outdoor pools, a water slide, and a “lazy river” for floating and a tubing hill that runs year round, your stay at Sunset Lodging will be nothing short of amazing. Everything was just perfect. The staff helped us find just the right home to fit our large family’s needs. The home was nicely furnished, the kitchen was well stocked with dishes, serviceware, appliances and cooking/baking supplies. We loved the large living space and the dining room table when all 12 of us could sit together. A special treat was the 7 deer who visited the yard each morning and evening! After 30 year of renting homes in Sunriver, this was by far the best! 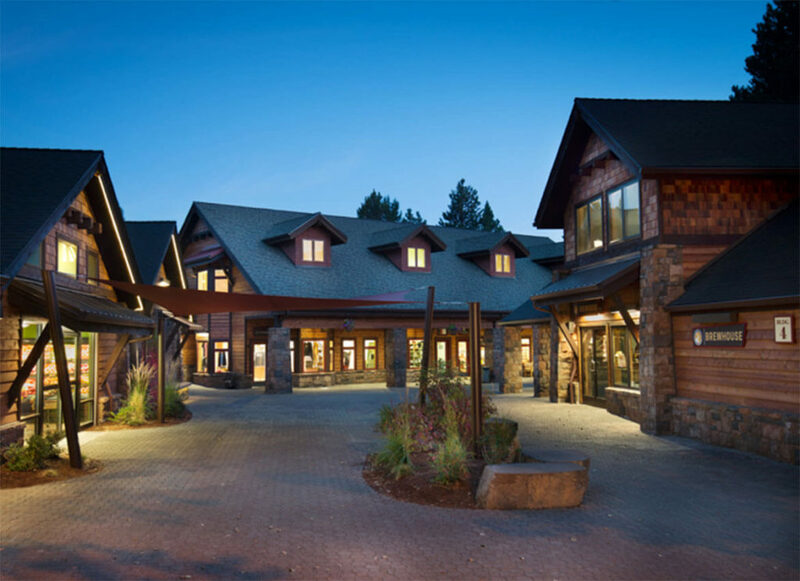 Enjoy the Sunriver Homeowners Association Recreation Center (SHARC) with unlimited use passes available from vacation rentals at Sunriver. 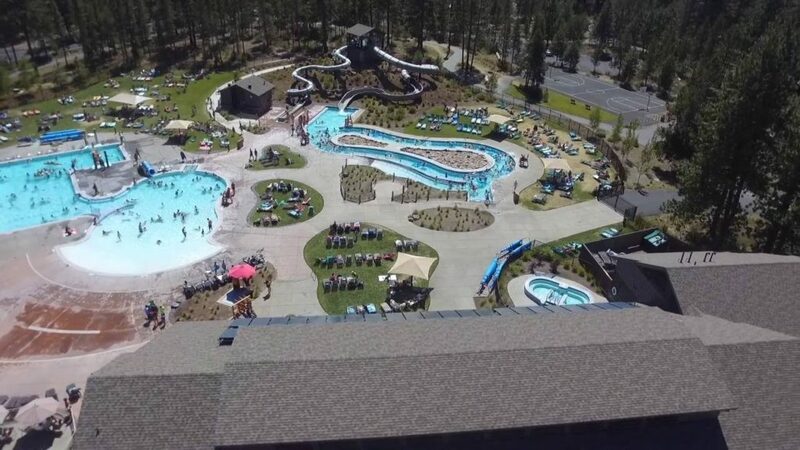 Sunriver’s newest attraction is the Sunriver Homeowners Aquatic and Recreation Center (SHARC). This fully outfitted aquatic center is complete with swimming pools, a lazy river, and hot tubs. 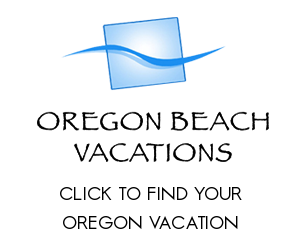 Many of their vacation homes offer complimentary passes with your reservation! 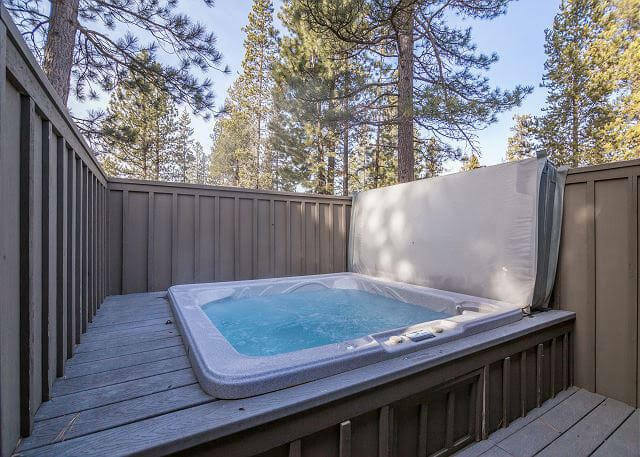 Sunset Lodging in Sunriver is offering up to 50% off on their vacation rentals in Sunriver from September 4 until November 18 of 2018. During Thanksgiving week, they are offering the 5th night FREE when guests stay for at least 4 nights. During Christmas week December 18-26 Sunset Lodging is offering the 7th night free when guests stay for at least 6 nights. 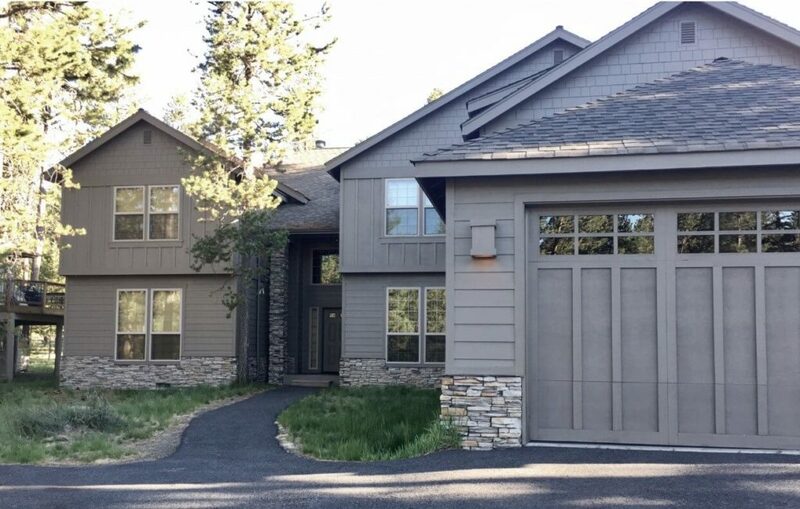 If you would like further information about any of the Sunriver vacation rentals or Sunriver property management services please call 1-800-541-1756, or head over to their website at sunriverlodging.com.